Impulse Control: Hold on a Second | All Around Dogs Impulse Control: Hold on a Second | Thoughts on training and life with dogs. I have talked a little about teaching impulse control in a previous post, but what about a dog’s natural impulse control? Just like humans, some have more than others. It has been interesting living with two dogs of the same breed with a lot of similar habits and traits, but such vastly different personalities and qualities. 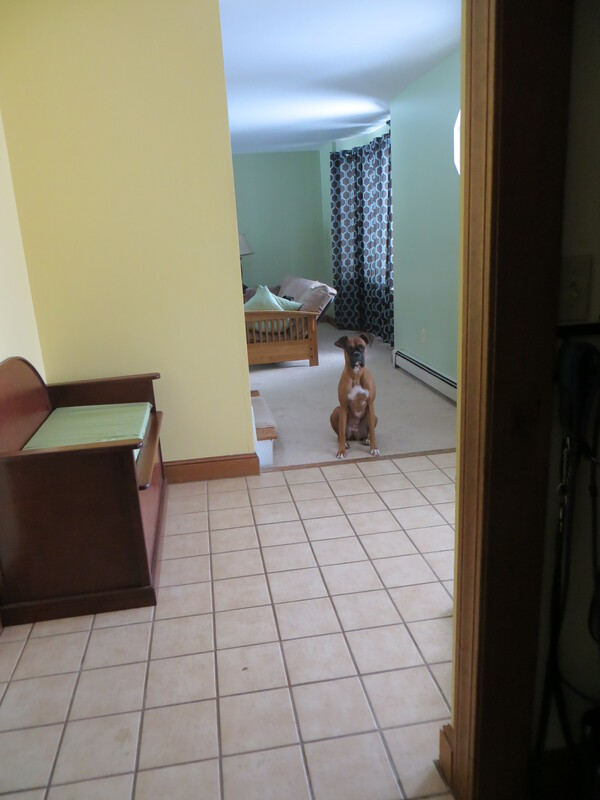 Arriving home is a clear example of their natural impulse control. Delta chooses to sit and wait – we didn’t teach her that or even encourage it, that’s just how she decided she would do things. That isn’t to say she greets me calmly. As soon as I say hello and step inside, she’s dancing around, spinning and jumping, sometimes even squealing with joy. But she holds back that initial urge and waits until I’m accessible. 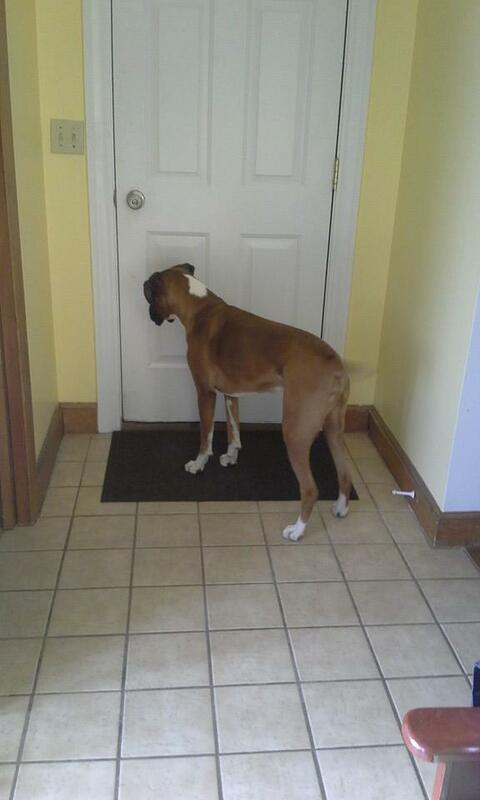 Dash is like the old lyrics – “so excited and just can’t hide it!” He has his nose so close to the door before it opens, it is a wonder he hasn’t been smacked in the face. As you can see, my example photo couldn’t even be from the “entering the house” perspective – from the camera’s perspective he is a literal blur of motion once the door opens. The photo above was taken when Aaron had just pulled into the garage. This one trait has a major impact on their everyday lives and our training together. Dash’s behavior issues tie into and are compounded by a lack of good impulse control. Thankfully he’s smart and biddable so he can be taught the skills. His tendency to get adrenalized and low tolerance for frustration has made that learning a struggle, but we are making progress. It is hard and rewarding work. In contrast, Delta’s progress in sport training has been in part because of her healthy dose of impulse control. We haven’t been in the ring much and we still have a lot to learn, but her ability to *not* do things gives us an advantage. Obedience stays, start lines in agility, even learning the bark and hold when we were doing IPO. Being able to wait for the next thing gives us a leg up. She needs to be taught the rules but her control allows her to be more successful in following them, even when she’s excited, without a lot of nagging from me. What about your dogs? Who has impulse control and who needs a little help? Can you think of an example that shows which end of the spectrum they land on? Neither of my dogs have ANY natural impulse control, except occasionally when it comes to things like waiting until I’m out of the room to get into the garbage. When I get home from work (or from being outside for 10 seconds) they are extremely excited and want to jump all over me. I’ve worked on impulse control with them a lot in the past, and they can learn pretty easily, but I need to be more consistent. Luna doesn’t have very good impulse control. Yesterday I lost half a bagel to a hungry beagle during a photo shoot for our blog! I am not sure I consider food thievery impulse control. Afterall “don’t eat food right in front of you” is a pretty human concept & most of us have to teach a “leave it” which is trained impulse control rather than natural. If food thievery counts against innate impulse control, I’d have to change my answer about Delta. She’s an opportunist -which all dogs are really, but she is more voracious than most! She has the highest food drive of any dog I’ve met so far. Fortunately for us, we need the extra bit of motivation for Riley. But we have found one thing she likes to do… after running a section of jumps, she loves to head straight to her crate. We have it now as a reward at the end of class she is allowed to run across the field to her crate!! Your impulse control posts have been very informative – we’re learning a lot and with practice, we hope to get things down with our new pups! Impulse control is definitely still a work in progress in my house! Dex has kinda good impulse control. How so, Carol? Do you have an example of his natural impulse control? I find it is hard to find too many examples because a lot of our training influences their impulse behavior. 🙂 Delta still shows us, we just get to be fully in the house before the lovefest.